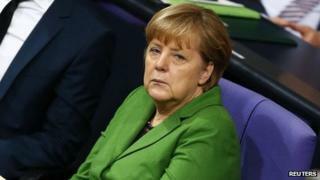 Chancellor Angela Merkel has warned that reports of US spying in Germany - including bugging her mobile phone - are straining transatlantic ties. The alleged spying by the National Security Agency (NSA) "must be explained and more importantly new trust must be built up for the future", she told German MPs. The allegations dominated the news during an EU summit last month. Ms Merkel said the NSA affair was putting EU-US trade talks to the test. She also said Germany's relations with the US "are of paramount importance". The German government has said it is keen to hear directly from the fugitive NSA leaker Edward Snowden about the agency's collection of phone and internet data. But Germany says it cannot offer him asylum because he would have to make his application on German soil. According to his leaks, the NSA targeted communications among Washington's Western allies, including Ms Merkel's mobile phone and EU offices. "The accusations are grave," Ms Merkel said in her statement on Monday. She did not comment specifically on the alleged bugging of her phone. The Bundestag - Germany's lower house - is holding a special debate on the NSA spying allegations. The scale of NSA surveillance in Germany is not clear, and last month Germany sent some senior officials to Washington to find out more. German media report that the German secret services exchange intelligence with their US counterparts. But recently the British newspaper the Independent, citing leaks from Mr Snowden, said the UK spy agency GCHQ had tapped into communications using a listening post on the roof of the British embassy in Berlin. Mr Snowden, 30, fled to Russia in June after leaking details of far-reaching US espionage. He has temporary asylum, allowing him to live in Russia, until July 2014.